Disney’s own Mickey Mouse Clubhouse will keep every child’s weekday morning fun and amazing as it joins TV5 Kids starting June 6. Pinoy kids will definitely delight in the singing, dancing and problem-solving activities brought by the lovable Mickey Mouse and his good friends Minnie Mouse, Donald Duck, Daisy Duck, Goofy, and Pluto. Bringing fun and easy learning, the first-ever computer-generated 3D animation TV series will feature an array of interesting episodes that will help young viewers specifically pre-schoolers, solve a specific age-appropriate problem utilizing their basic skills, such as identifying shapes and counting from one to ten. It’s time for Pinoy kids to experience the fun and amazement offered by the world-famous gang of Mickey Mouse and his friends. 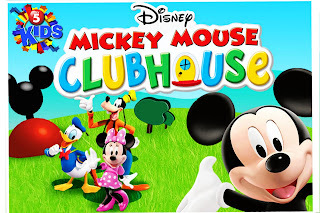 Mickey Mouse Clubhouse airs weekday mornings at 8:00 a.m. on TV5.